To sell any more than 5 vehicles per year in North Carolina, you will need to apply for a license from the Division of Motor Vehicles at the Department of Transportation (NCDOT). To get licensed you need to fulfill several licensing criteria and requirements – have a physical location for your dealership, obtain proper insurance, as well as a North Carolina auto dealer bond, and more. 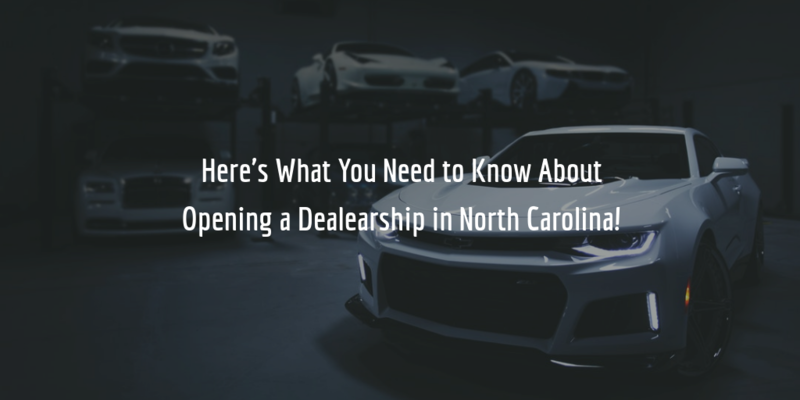 See below for a comprehensive breakdown of the NC dealer license application process! According to the definitions in §20-288 of the North Carolina General Statutes (NCGS), distributors sell new vehicles to new vehicle dealers, whereas wholesale dealers sell used motor vehicles to used vehicle dealers. Manufacturers work with distributors who distribute the vehicles that the former produce. There are slightly different licensing requirements for the various license types, so you first need to pick the license type you want to apply for. The North Carolina auto dealer bond form states that the condition of the bond agreement is that licensed and bonded dealers will comply with Articles 12 and 15 of Chapter 20 of the NCGS. These articles specify the obligations and responsibilities that licensed dealers have towards the state and public in providing auto dealer services. If they should violate any of these conditions and thereby cause harm to the state or public, a claim can be filed against their bond. The surety, after investigating the claim, will typically extend compensation to claimants. The maximum amount of such compensation can be as high as the full $50,000 amount of the bond. To get bonded, applicants only need to pay a fraction of that amount though. Surety bond cost is determined on the basis of applicants’ credit score, their business and financial statements, their liquidity and assets, as well as their resume. The higher applicants’ credit score and the better their financial indicators, the lower their bond rate is! Want to know how much your bond rate would be? Complete our bond application form and we will shortly provide you with a free quote! There are no obligations attached to requesting a quote. Get easily your wholesale dealer license for Missouri with US Dealer Licensing which is provide excellent service. US Dealer Licensing helps dealers with a wide variety of opportunities when it comes to buying and selling. Our dealer license essentially covers everything except retail.